Tamil film actor Shaam (Shamsuddin Ibrahim) made his debut as a cop in Kick (starring Ravi Teja, Ileana), directed by Surender Reddy two years ago. Subsequently he went on to act in Kalyan Ram's Kathi in 2010. Now Shaam has returned with Ravi Teja in Veera. In an interview, Shaam talks to Radhika Rajamani about Veera, the bond he shares with Ravi Teja and the Tamil and Telugu projects he's working on. Is it because Veera is another Ravi Teja film that you signed it? One of course was the fact that Ravi Teja and (music director) Thaman S have come together. 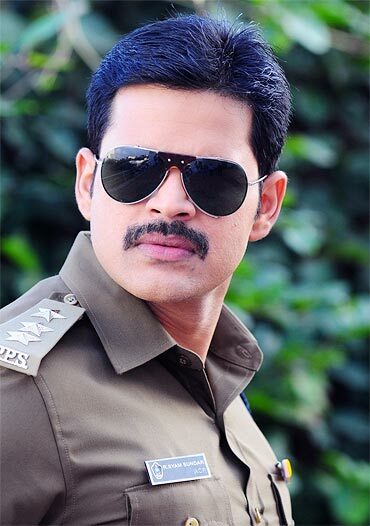 Though I play the role of a cop in Veera too, it's different from Kick. The director is good and he gave me a good narration. After Kick, I got offers for the same genres but I wanted to do something 'hatke'. I told myself I would do Veera to keep myself on. You seem to share a special bond with Ravi Teja especially after Kick. I like him a lot. He is a performer and I have watched and enjoyed his films. I call him bhaiyya. He is family. I drop by at his place when I am in Hyderabad. He is a mass hero and very special. I admire him because he doesn't have any film background or a godfather in the business. I've learnt a lot from him. What's your role in Veera? So we assume there's a lot of action. Yes, there is. In fact, the whole film is action-oriented. But when Ravi Teja chooses a film, every aspect is taken care of -- romance, action, comedy etc. Veera is a commercial masala film with a message. It also has beautiful songs by Thaman S.
Are you comfortable in Telugu now that you have done three films? In Kick, I found it difficult to deliver dialogues as Telugu was an alien language then. Now I can deliver 10-15 lines at a stretch. I have been learning the basics of Telugu. Offers are plenty in Telugu. I choose to work with good directors. Suri (Surendar Reddy, director of Kick) is like family to me. I also want to do a straight Telugu hero film. How was Ramesh Varma as a director? Ramesh Varma is clear about what he wants.He does not make changes after whatever is written. There's no confusion about the script and he keeps everybody's performance different. Even Chota K Naidu, the cinematographer, is a fantastic cameraman but he would not restrict himself to framing, he would go beyond his calling. It was a great team to work with. Though you were in Kalyan Ram's Kathi, we didn't get to see much of you. Why is that? I don't know why. They shot quite a bit. The role was meatier. (And I must say) I was disappointed. So much effort and money went into shooting that. In the end, it was the director's decision. Are you planning to have a foothold in the Telugu film industry too? Certainly! I am trying to create a market for myself so I can do more bi-lingual (Tamil-Telugu) movies. I thank the audience for the way they have accepting me so wholeheartedly. They call me Kick Shaam! People come up to me and talk, tell me they want to see more of me. It's all very encouraging. Now that you have worked in both the Tamil and Telugu industries, what would you say is the difference? There's not much of a difference. There is the same dedication and organisation in both the industries. In the Telugu industry, the heroes and directors are friendly. Once NTR came on to the set when we were shooting. What are your future projects in Telugu and Tamil? I'll be doing Suri's (Surender Reddy) film. I hope to be in all his films. He gave me a terrific role, which demands 40 days. But the film I'm doing now doesn't give me that much time. So now I hope to shoot 12-15 days at a stretch for Suri's film. I am now doing 6. We are planning it as a bi-lingual, which is being directed by Durai (of Mugavari and Thotti Jaya fame). The script demands three different looks. So I have three get-ups. I have to lose 15 kilos, have a long beard and look like a guy who has just graduated from college. I am waiting for something like this as every actor has the potential. 6 gives me the real opportunity to show my talent. I had signed the Telugu film Kshetram opposite Priyamani. It was a beautiful story with Jagapathi Babu also starring in it. But the strike in the Telugu industry cost us 60 days. For the next 4-5 months I will be busy with the shoot of 6 so I don't know whether I'd end up doing it. There are a couple of other offers. There is one from RR Moviemakers for a film with Nag (Nagarjuna) Sir and they want 45 days. I just wish it happens! And of course there are offers from debutante directors too. I am a workaholic. I've been a footballer since my college days. I am passionate about the game. Football helped me keep fit. So much so, now I can't do without going to the gym for an hour! Do you watch your diet too? Exercising is only 20-30 per cent. Diet is important. I am very strict about my diet. How has the journey in cinema been? The journey has been nice. When I was a model, I thought it was tough to be the chosen one in the glamour industry. Then 12B happened and I got a chance to act with Jyothika and Simran. I sharpened myself. I have been around for nine years and I thank God for it. After 12B, there was struggle, effort, determination and dedication. So far so good. I look forward to a bright future. A few years ago, I was lacking in experience. Now I have gained that and I am confident my steps in the future will be right. I met Salman Khan recently. He wished me and told me that I'd done a fantastic job in Kick. It would be great if I can do the Hindi remake. I've done the Tamil one and the Kannada one will begin in August. I am a staunch believer in destiny. I believe one should do the effort and leave the rest to God! Television -- last resort for Bollywood's heroines?